I've been watching a world famous Bald Eagle web cam for the last two years. The cam is located in Decorah Iowa. Along with several other friends I met through watching this eagle family, I decided to go to Decorah this year to see the eagles in person. These photos are of the parents and this year's fledglings. The young eagles fledged about 2 to 2.5 weeks before we arrived and were exploring the environment in a two or three block range around their nest. The fledglings were given the names D12, D13, and D14 in the order of their hatching. 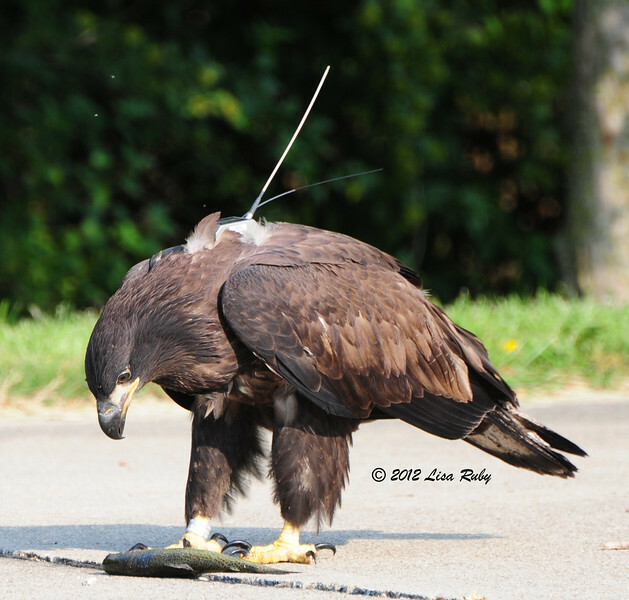 These are the 12th, 13th and 14th eaglets raised by these parents. This was an amazing opportunity to watch and photograph these beautiful creatures. Thank you to Raptor Resource Project who put up the nest cams and who do such a wonderful job via their Facebook page, their web site forum and their Ustream chat of educating everyone about raptors. RRP fitted D14 with a transmitter not too long ago. That is the thing you will see on her back with the antennae coming out of it in these photos. One of last year's juvies has one too, and she is now in northern Canada near Hudson Bay. Over last winter she was back in Decorah and neighboring areas. Unfortunately a tragedy befell this beautiful family while we were there. The oldest fledgling D12, was electrocuted while sitting on a power pole. The power company has gone out and worked on raptor proofing the pole as well as several others in the area. They thought they had already done the right things to avoid this kind of thing, but apparently it wasn't enough. It was a devastating loss for everyone involved in watching this nest.